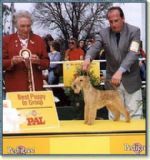 AUSTRALIAN GRAND CHAMPION SANDIMORN PAY THE PIPER, ONE OF HER MANY WIN DURING HER ILLUSTRIOUS CAREER. Multi Best in Show winning Australian Champion Sandimorn Poker Face (Jinny). First black lakeland to be awarded Best Exhibit in Show in Australia. MULTI CHAMPION KAJSENBORG'S SPECIAL OFFER (IMPORTED FROM DENMARK). 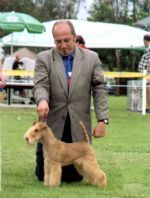 IN JUST TWO MONTHS OF SHOWING IN AUSTRALIA "STOFFER" IS ALREADY A MULTI ALL BREEDS BEST EXHIBIT IN SHOW WINNER WITH MANY MORE TO COME. 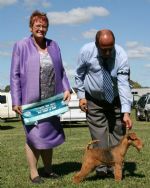 AUSTRALIAN CHAMPION SANDIMORN CAUSIN MAYHEM,PIPER'S MUM. PHOTO TAKEN AT MELBOURNE ROYAL. 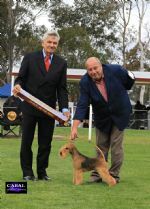 AUSTRALIAN SUPREME CHAMPION SANDIMORN HALHATH NOFURY, WINNING ONE OF HER MANY ALL BREEDS BEST EXHIBIT IN SHOWS. AUSTRALIAN GRAND CHAMPION SANDIMORN WHYTLINE FEVER, ONE OF HIS MANY TRIUMPHS..